This week, they released another great ebook for free! 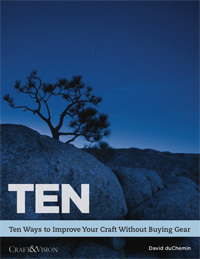 It’s called TEN and it talks about ten ways you can improve your photography, without buying any gear. It was actually one of the first ebooks they released awhile ago, and it originally sold for $5, but now it’s completely free! TEN was one of the first ebooks I bought from Craft & Vision, and it’s still one of my favorites. I think it really helps set the tone of the rest of their ebooks, because they strongly believe that the most important aspects of photography are knowing how to use your camera and developing your unique vision of the world. As photographers, I think it’s easy to get gear lust and think that more gear will make us better, but really it’s all about knowing how to use the stuff we already have and working to refine our vision. Note: due to their shopping cart system, it looks like they can only give away a certain number of ebooks per day. So, if you get an error message while trying to download the ebook, then wait a day, or subscribe to their mailing list to get the ebook immediately!